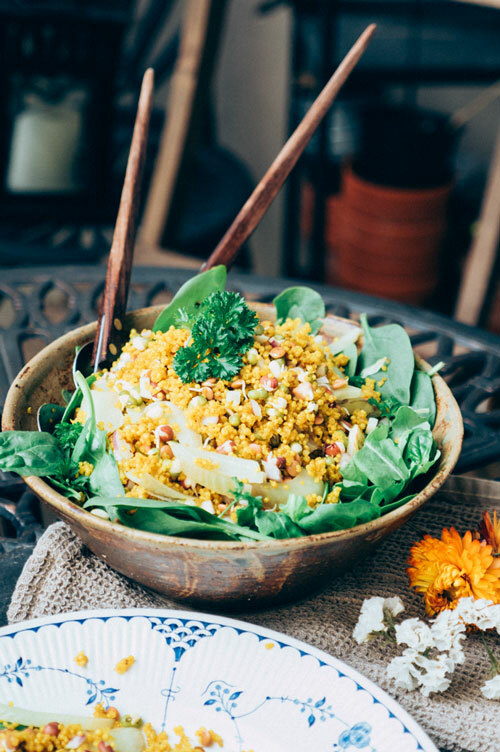 This turmeric quinoa salad with sprouted beans and fennel ticks many health boxes which is great as the seasons are changing and colds take over the western hemisphere. Such a simple and nutrient rich dish which works well for both lunch and dinner, as a side or as a main. 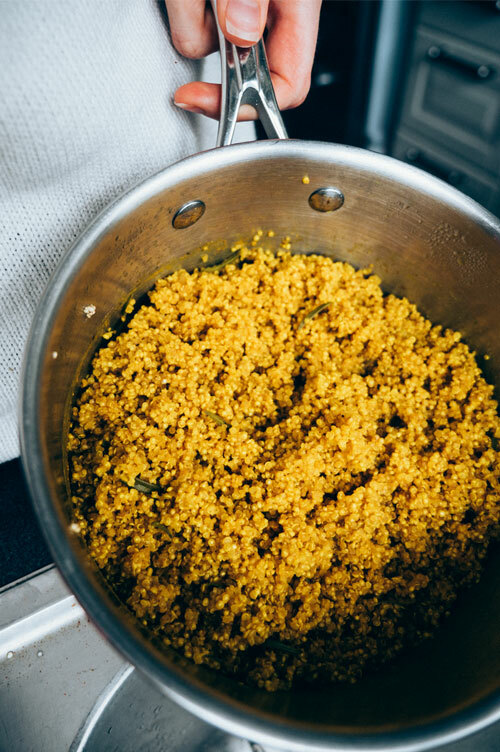 Turmeric and quinoa are both hot on the superfoods list so let’s combine them! Quinoa is a seed which is packed with complete protein making it a very good addition to any vegan diet. 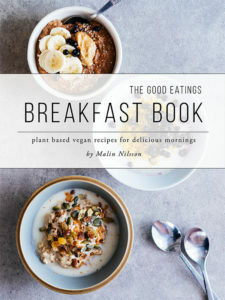 It also suits a gluten free diet as I always used to find myself looking for substitute to glutenous and white grains. 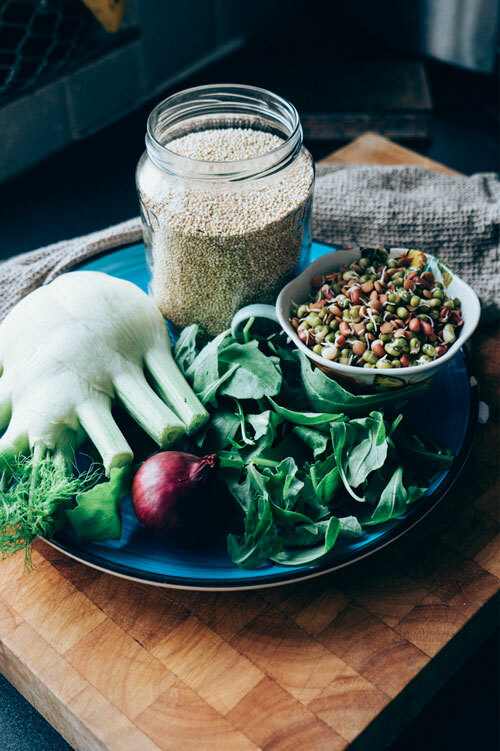 Quinoa is also high in manganese which aids in metabolising of cholesterol, carbs and amino acids and even wound healing functions in the body. 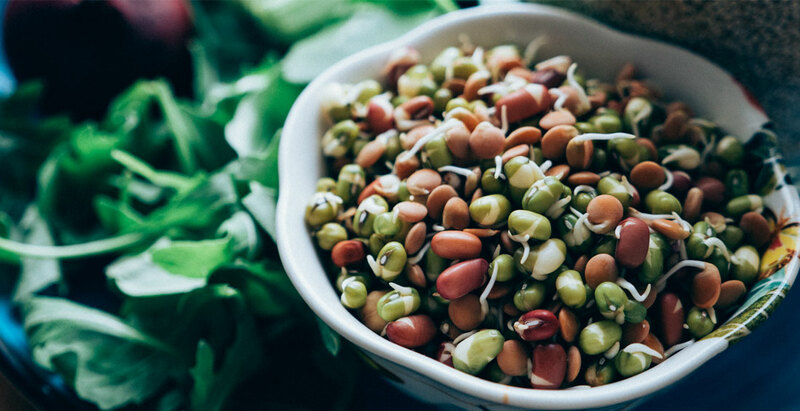 The addition of sprouted beans makes this dish a protein powerhouse and adds a raw element which has been activated to offer its most potent state in terms of nutrition. Further I included fennel because it’s something which helps me keep my stomach on track. It also has strong antioxidant activity which pairs up nicely with turmeric. Turmeric is the real show stopper in this dish though! It is an anti-inflammatory agent, can prevent alzheimers, neutralises free-radicals and boosts antioxidant enzyme activity to protect your cells and keep them healthy. This effect on the cells can help during cancer treatment or prevent it in the first place. One last little note, turmeric is absorbed easier when consumed with pepper! Active cooking time 20 min, all in all 35 min. Rinse quinoa under running water until completely wet. Place in pot with water and spices on high heat. Let it come to a boil and then turn to low heat for a 20 min simmer (or until all water is gone). Turn off heat and place a tea towel underneath the lid to absorb steam. Remove sprigs and the end of the fennel bulb and slice finely. Place pan over medum heat and add coconut oil. Sautee fennel until it looks shiny and soft. Mix fennel, sprouted beans and onion with olive oil, salt and pepper. Add quinoa and mix again. 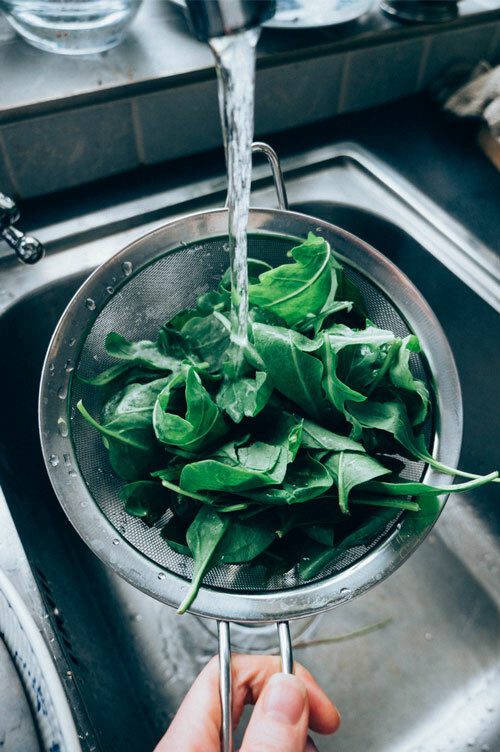 Serve warm on top of rocket leaves and save leftovers for a lunch box base. Enjoy knowing you’re giving your body lots of plant protein and amazing health benefits! Yes, I think black pepper is equally good but it’s quite cool how foods effect each other. Always amazed with food and our bodies ability to process it! Malin! You are a true artist. Just like a painter, you create true magic with healthy food!! I love to watch you and find your videos amazingly creative, relaxing and just magnificent!! Thank you for sharing your world with the rest of us. I just recently started this Whole Plant Foods journey myself and am inspired to eat & be more than I was before because of you! Would you share how you sprout the beans? My daughter sometimes suffers from stomach pain when eating beans so I thought this might be a great thing to try. Thanks! Thank you for this positive feedback and kind words – I really appreciate it! I’m sorry to hear that you’re daughter suffers from tummy aches sometimes, I know all about that and it’s not fun at all. Back when I was making this recipe I used to buy pre-sprouted pulses at the supermarket but it’s atually very easy to do yourself. I’d be happy to share a tutorial but it will take me a few weeks so until then you might want to google it as there are many good posts and tutorials out there for how to do it. All you really need is a jar, a bowl, some lentils/mung beans/sprouting seeds, water, a muslin cloth and a rubber band. And some time! As it takes a few days and a little patience to do. I’ll keep in mind to make a post about sprouting soon.